Entering through the tall, leather-clad doors you were instantly humbled. This was a sacred place, a citadel of world literature, a bulwark of British history constructed in an era when studious inquiry was less diverse and a Kingdom’s National Museum and Library were sensibly cloistered together … unlike the knowable world of today, which branches into uncountable disciplines. There will never be another place like it. 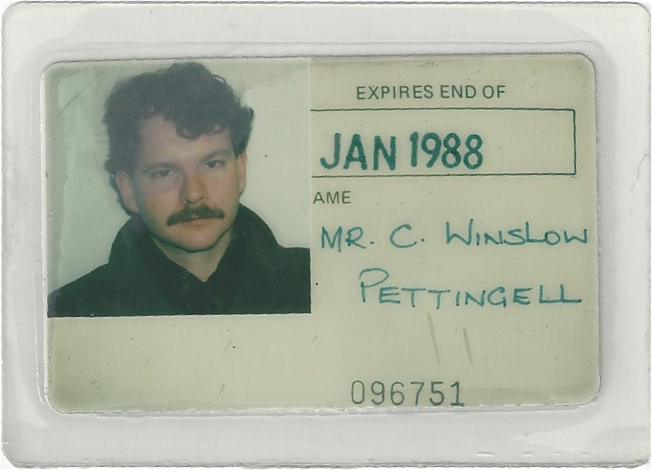 Pictured is my second Reader’s Ticket for the British Museum Reading Room, duly granted by the Principal Librarian in January of 1985. It is purposely non-descript, I suppose, because access was restricted only to registered researchers who’d received their credential through written request. In truth my serious research days were over, unlike a few years earlier when I was a proper habitué working on a dissertation. By the time it expired I was living another life on another continent. Still, it transports me back to the smell of ancient books and old leather; and the spectral drifting of aging academics entranced by the esoterica of their subject matter; and to shafts of daylight filtering down from the great windows encircling the room’s magnificent dome. And to the hushed murmur of the catalogers at the Centre Desk, where the occasional clap of a closing book softly echoed through the vast expanse above our heads. It especially takes me back to a bygone time of Victorian grace. Inspired by the domed Pantheon in Rome, the circular Reading Room was a triumph of mid-19th century technology with the latest in heating and ventilation systems, a gorgeous papier-mâché suspended ceiling, and nearly 25 miles of shelving for its cast iron stacks. Those leather-clad doors were first opened in 1857 to all who could present a Reader’s Ticket, and for the next 140 years it served as workplace and refuge for an astonishing array of scholars, researchers, and such writers as: Kipling, Carlyle, Browning, Darwin, Dickens, Yeats, Shaw, and Oscar Wilde, Bram Stoker, George Eliot, Arthur Conan Doyle, Mark Twain, H. G. Wells, T.S. Elliot, George Orwell, Sylvia Plath, and Mohandas Gandhi. There were also those bent on a specific kind of truth. ‘‘The fact of a man’s being a political exile does not exclude him from the Reading Room,” stated the Library’s 1866 Handbook for Readers … and the exiles appeared. While desks could not be reserved, determined regulars, some of whom would be pacing in front of the Museum’s columned entrance, could gain admission with the flash of their ticket before the Museum’s official opening at 9:30 and claim their cherished spot. Mine was G3. Whereas most had a specific agenda, not everyone was able to retain focus – to put it charitably – and the Reading Room had its share of credentialed eccentrics. Stories abound of the middle aged Reader who’d submitted the same Master’s thesis for over a decade, merely rearranging the paragraphs with each submission; and of the Reader who’d use a rope to lower an anchor to the floor before beginning; and of the prominent occultist who claimed that while her astral body was in the Reading Room her material self was off lecturing in America. Then there was the celebrated “Miss McDonald” who, for 50 years, bicycled in from Highgate wearing white Bermuda shorts and plimsolls (sneakers) before settling in at Lenin’s favored desk, where she’d hang some twine between the reading lamps from which she’d dangle anti-Papist tracts. While her work entailed translating Virgil into French no one actually knew what she was working on, nor did they really care. In truth the place itself was rather eccentric. Rest assured that a book of regulations accompanied that Reader’s Ticket, with highly specific MUSTs – e.g. Readers MUST conduct themselves in an orderly manner at all times while on the library premises; and remain silent while at desks; and return all issued books to an assistant at the Centre Desk, where they must reclaim the application slips by which they obtained them before leaving the room. And even more specific MUST NOTs – Readers MUST NOT eat sweets or any other kind of food, or drink anything, or chew gum; or remove any book or other property of the British Library from the room in which it was used; or allow any book to come into contact with writing materials, rubber bands, paper clips or pins; or bring in any materials or objects which could damage a book, including food, paste and glue, ink in bottles, adhesive tapes, scissors, and knives; or use cameras or electrostatic copying machines; or behave in any way likely to disturb other readers…. To request a book you’d consult the printed catalogue and fill out a form on carbon-triplicate paper. Next you’d “post” the form through a little wooden window at the Centre Desk and watch while it was placed in a small cylindrical capsule, which was whisked away (with a ghostly whoooooshhhh) through a pneumatic tube. In time your books were delivered to your numbered desk on an antique trolley, with a carbon tucked between the pages. This was always an intoxicating moment. Although I didn’t need to, in addition to a latter-day edition with its useful foreword and essential footnotes, I’d always order up a first edition of whatever volume I was referencing, As a result I could sit at my prodigious desk with its padded blue leather and matching shelf (designed to fold-out and cradle a book while the reader took notes) and hold in my hands the first editions of Wordsworth’s Prelude, and Whitman’s Leaves of Grass, and Emerson’s Nature … and Thoreau’s Walden. As with Miss McDonald, nobody knew or cared what I was doing, but beyond the random flight of fancy (at one point I was actually set on learning ancient Greek) I managed to avoid her fate, with a comfortable routine of working ’til noon, then breaking for tea and a sandwich, followed by a quick visit to the Rosetta Stone, or the Elgin Marbles, or (especially) the grand Clock Room, before returning to my desk until closing. Time flew in those days, just as it does now. The British Museum Reading Room closed in 1997 when most of its resources were moved to the (now separate) British Library’s state-of-the-art repository near St. Pancras Station. It reopened to ALL visitors in 2000 and housed a modern information center reading material that focused on world cultures represented in the Museum. Closing again in 2007, this time the old desks were boarded over and the space used for temporary exhibitions. 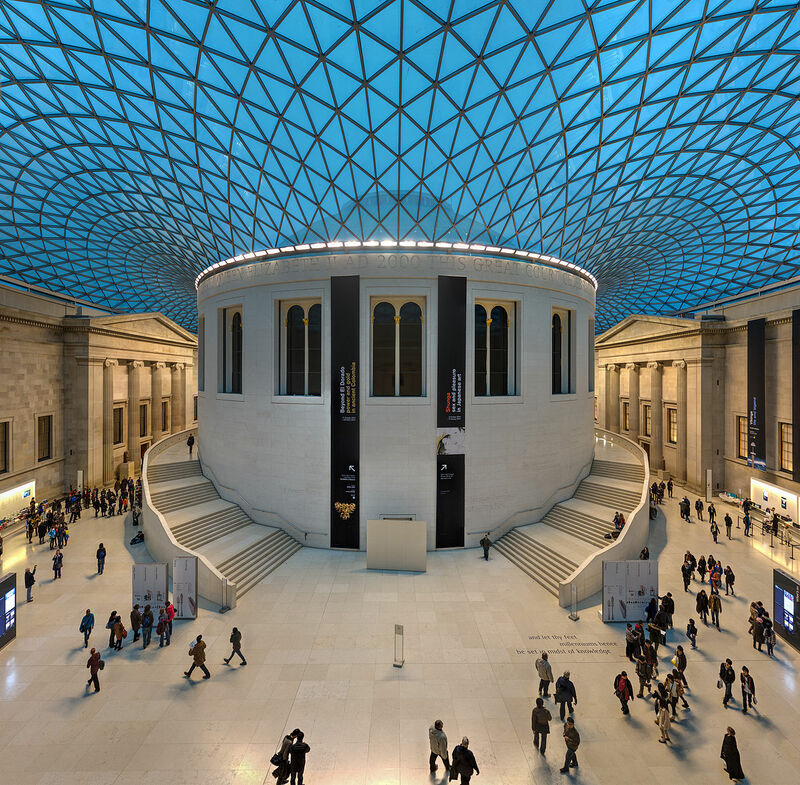 When the British Museum opened its World Conservation and Exhibitions Centre in 2014, the Reading Room lost even its temporary function and its future now remains undecided. I brought my son for a visit in the summer of 2006, prior to that final closing, and was thoroughly amazed at the wondrous transformation. When it was built, the Reading Room (designed by Sydney Smirke) had displaced the British Museum’s original Great Court (designed by Sydney’s older brother, Robert). But with the late 1990s renovation the Great Court was at last revived, and the Reading Room intriguingly encapsulated in its center. At over two acres, it is now the largest covered public square in Europe and truly an architectural triumph. Upon stepping off the Northern Line and rising up into the hurly-burly of Tottenham Court Road, it was a 4-minute walk from Goodge Street Station – once a deep-level Word War II air raid shelter from which some would indeed come “smashing into neon streets in their stonedness,” – to this very spot in the heart of leafy Bloomsbury. And I never once failed to conjure up this song, albeit Judy Collin’s version. Looking back I think Donovan Philips Leitch got a bum rap. Widely referred to as the “Poor Man’s Dylan,” partly because the two were influenced by many of the same folk sources but mostly as a result of their 1964 Dylan-centric meeting as seen in Don’t Look Back, Donovan’s distinctive style was actually far more eclectic, blending folk, jazz, psychedelia, pop, calypso, and world music. Released on his second album, Fairyland in 1965, Dylan never sounded like this. winslow, thank you for your slice of history.